Identify and designate key practice staff with VFC Program responsibilities. You will be prompted to provide the names of your practice’s VFC Provider of Record, Vaccine Coordinator, Backup Vaccine Coordinator and Provider of Record Designee as part of your VFC enrollment application. Provider of Record (POR): The clinic’s Provider of Record (POR) is responsible for the clinic’s overall compliance with VFC Program requirements. Candidates are typically licensed as a Medical Doctor (MD), Doctor of Osteopathy (DO), Nurse Practitioner (NP), Physician assistant (PA), Pharmacist, or a Certified Nurse Midwife with prescription-writing privileges in the state of California. Vaccine Coordinator: A designated, on-site, and fully trained staff member responsible for all vaccine management activities within the practice. Backup Vaccine Coordinator: A designated, on-site, and fully trained staff member responsible for all vaccine management activities within the practice when the Vaccine Coordinator is unavailable. Provider of Record Designee: An on-site staff member designated by the clinic’s Provider of Record to act on his/her behalf for VFC Program related matters when the POR is unavailable. Complete all required EZIZ lessons found on the EZIZ website. The Provider of Record, Vaccine Coordinator, Backup Vaccine Coordinator and Provider of Record Designee must take these lessons that offer a great overview about the VFC Program, its participation requirements, and vaccine management responsibilities. Register as a “New Enrollment” in order to receive the necessary user ID and completion code, then start the training. After completing all the required lessons, each registered EZIZ user from your clinic will receive a unique User ID and Confirmation Code that will be visible on your Learning History page. 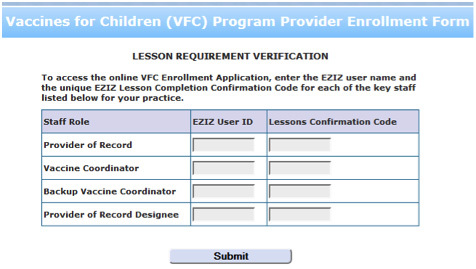 If you are an existing EZIZ user (i.e., you work at a practice that is already a VFC provider but are opening a new site with the same key practice staff), call the VFC Call Center at 1-877-243-8832 so that we can generate a user ID and completion code for you. Download and review the job aids and guides that will prepare your staff to enroll in the VFC Program. Make sure your vaccine storage equipment meets VFC requirements. All prospective VFC Program participants MUST comply with requirements prior to enrolling in the program. Download and complete the Provider Enrollment Worksheet. Use the Provider Enrollment Worksheet to gather information needed ahead of time to complete the online Enrollment form. DO NOT SUBMIT the worksheet to the VFC Program. To begin, you will need each key clinic staff member’s User ID and Confirmation Code. Note: Federally Qualified Health Centers/Rural Health Centers (FQHC/RHC) applying for enrollment in VFC must submit a copy of their FQHC or RHC license/certification by either uploading through the online form or faxing a copy to 877-329-9832. The VFC Program will review your enrollment form to ensure completeness and that your practice has met all the requirements necessary for becoming a VFC provider. Once your application has been verified, your regional VFC Field Representative will contact you within 5 business days to schedule a required New Provider Site Visit. Once your site is approved, you will receive a VFC Provider Identification Number or PIN. You will need this number for all interactions with the VFC Program. Once your new PIN number is assigned, VFC will process your first vaccine order.